Moving can be stressful time in an individual’s life especially he or she hasn’t hired a professional moving services. 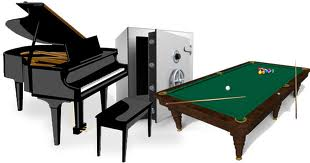 Pianos and pool tables moves can be stressful because the owner needs to have a specialized knowledge and skills to safely move these things. Many of you may be wondering why you would need the professional moving services to move your piano and pool table. The primary reason to employ professional movers is because many local moving services do not have adequate experience to move these priceless things.